Denon’s S-5BD combines a Blu-ray player and a home theatre receiver, for those AV enthusiasts who want the high-end equipment, but who don’t have the space for the separate components. And AV receivers and Blu-ray players are two things Denon do very well, so it’ll be interesting to see how this combo stacks up. Development of the S-5BD has not been consumer-led, instead it is Denon’s perception that there exists a gap in the market for this product. On the front-panel are: HDMI (3 inputs/1 output, all certified for HDMI 1.4, SD card inputs, plus direct iPod connectivity via the USB port. Speaking of connectivity of the S-5BD can also entertain you in multiple rooms – people could be watching a Blu-ray movie in the lounge room, while simultaneously a CD is busting out in the study. First up out of the box, the S-5BD’s ‘First Setup’ feature automatically calibrates the unit to better suit the room’s acoustics using the supplied microphone. Audyssey MultEQ and Audyssey Dynamic Volume and Dynamic EQ help to deliver great sound without having to lose yourself in complex settings. Play much music on an iPod? The S-5BD uses a built-in Compressed Audio Restorer, designed to go some make to make the compressed music files sound a little better. The Automatic Sound Mode is a neat feature – play music, the S-5BD automatically switches to stereo sound; play video, it switches to surround sound. On the remote control there’s a ‘One Touch Play’ button for instant movie playback, buttons on the front are not only large, but only the most-used buttons are there. All the less-used functions are located benath a hidden back panel. 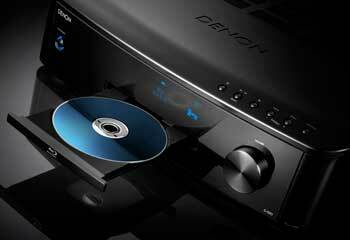 Denon’s S-5BD will go on sale in late April, at an RRP of $3,499. It is covered, as are all Denon products, by a two year warranty with an additional year of warranty provided when buyers register their purchase online with the local distributor.